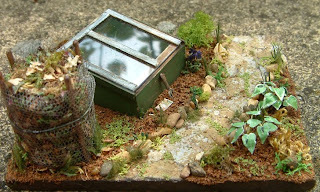 In the last blog we showed you some of our preparations.......seems fair to show the results in the 1/24th version of 'Down the Little Garden Path' ! 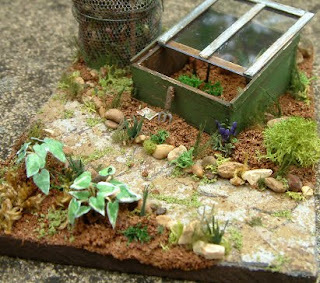 As we offer our little old garden projects in both 1/12th and 1/24th scales we create the 'show gardens' in both scales as well. Like any other miniatures, the two scales offer different opportunities and different challenges. In 1/12th scale it's possible to include more specific details - like individual petals on tiny flowers perhaps, while in 1/24th the challenge is to create even more of an illusion in such a small space. As always each garden will be just that little bit different! 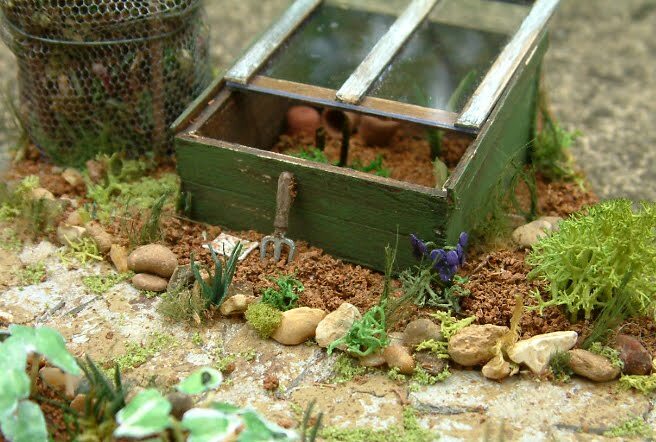 Again we've used the fabulous purple pansy kits - in 1/24th scale - supplied by Georgina Steeds and although they are tiny and delicate, they are truly so easy to assemble. The wonderfully authentic 1930's cold frame with the sliding lid is only 1 1/2inches square and the tiny hosta leaves still have nibbles made by the slugs on them......mmmm....the slugs are a bit of a challenge! This is the second Workshop in the series and as you'll see the garden projects can stand alone or join together alongside an existing house. There are some places still available to book on both the September and October half-day workshops and all the details are on the website, together with more pictures.